Students and potential employers fill the Whittemore Center for the CaPS Career & Internship Fair. At UNH, career preparation is not something students are left to figure out “later.” In this Q&A, UNH Career and Professional Success (CaPS) staff discuss the university’s commitment to helping students thrive after college and highlight career-preparation events students can take part in as early as semester one. Wildcat Parents: How does UNH view career preparation? CaPS: Career preparation is a critical component in every student’s development at the University of New Hampshire, and we’re working diligently with the entire campus community to show career preparation as a hallmark of a UNH education. The Career and Professional Success staff act as coaches, connectors and champions for our students and alumni. In partnership with our faculty, staff, employers and our global alumni network, we orchestrate opportunities for experiential learning, mentoring, networking and personal growth. Our students face an ever-changing future in the world of work, and UNH has made a commitment to equip students with the tools to thrive throughout their lives. Wildcat Parents: We’ve been hearing about the Wildcat Way to Professional Success. Could you tell us more about this new career preparedness model CaPS will be rolling out this year? 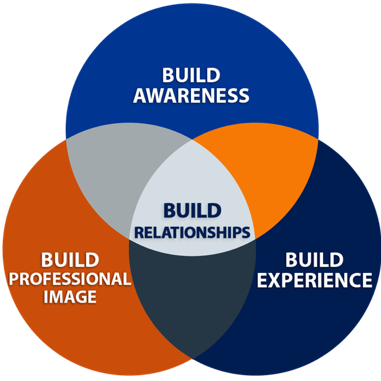 Build relationships with classmates, faculty, professionals and alumni as connections lead to opportunities and personal growth. Career and Professional Success provides events, services and coaching for students in each of these core areas as they explore career options and their path to personal and professional success. Wildcat Parents: When is the right time for Wildcats to begin visiting CaPS? CaPS: We encourage students to begin their career development as soon as they are ready. For some, this will be during their first year, while others may wait until they have a better idea of their major or direction. The Wildcat Way to Professional Success model is designed to provide students with action steps that can be taken throughout their time at UNH. With that being said, our career teams start interacting with students during the first year on campus. Though timelines can be individual to each student and/or the career path the student is looking to follow, we implore students to start thinking about their career and post-graduate plans far before the senior year. We work with these late-blooming seniors each year, but the earlier students start to plan for post-UNH life, the lower the stress levels around graduation! Wildcat Parents: Could you highlight some of the offerings CaPS has planned for the year ahead? CaPS: Career and Professional Success has seen record turnout from students in the last two years at many of our showcase events, and we’re excited to keep building these programs and offerings based on students’ needs. On Sept. 18, we welcomed 45-plus of our employer partners from 30+ businesses and organizations to campus for our biannual Resume Review Day. Students were able to have their resumes reviewed and receive valuable feedback directly from hiring professionals and recruiters in their field of interest. This event is repeated each semester and is wildly popular with both students and our outstanding employer partners volunteering their time. In addition to Resume Review Day and our signature Career & Internship Fair, held each semester, the Career and Professional Success teams in each college hold a number of industry-specific events for students and weekly Career Express Drop-In Hours for all students. From a new women’s leadership program in the College of Health and Human Services to new sophomore experiences and programming in COLSA and Paul to innovative industry partnerships in CEPS and Career Bootcamps in the College of Liberal Arts and UNH Manchester, Career and Professional Success is diversifying and expanding our offerings this year to best serve all kinds of students. The Career & Internship Fair, a signature event for students to connect with 200-plus organizations across a wide variety of industries, is set for Oct. 4 in the Whittemore Center. From graduating seniors looking for full-time jobs to underclass students seeking internship experience, all are encouraged to attend the fair. Learn more about the fall 2018 fair. Wildcat Parents: What can students expect to find at the upcoming Career & Internship Fair? CaPS: The Career & Internship Fair on Oct. 4 is a signature event for students to connect with an impressive list of 200-plus organizations across a wide variety of industries. Whether a graduating senior looking for that full-time job post-graduation or an underclass student looking for an internship experience, all are encouraged to attend the fair in the Whittemore Center to learn about the organizations and network with employers. First-time fair attendees also have the option of taking a guided tour of the Career & Internship Fair led by professional staff. We also provide a dedicated student preparation area to help answer any final questions or perfect the elevator pitch prior to meeting employers. UNH Alumni Relations also sponsors a free professional headshot photo station for LinkedIn and Wildcat Connections. New this year, Health and Wellness staff will also be available to help students destress and stay focused in a fun, interactive way before entering the fair. Wildcat Parents: Anything else you’d like to share? CaPS: Though we love working directly with our students and alumni, we recognize that the professional development and career preparedness needs of our students need to be supported around the clock. To meet these needs, we’ve implemented a number of career technology tools and resources that students can access anytime. Handshake, Wildcat Connections, VMock and Interview Stream are all tools that provide services in the job and internship search process, professional networking, resume development and interview skills. See all the career technology options and many other resources available on the CaPS website at unh.edu/career. April 26, 2017 | Misc.